This page will walk through Angular RxJS retry operator example. retry operator returns source Observable with the exception of an error. When source Observable calls error then retry operator resubscribe it for the maximum of given number of time. If Observable starts emitting elements and suppose at any point it calls error before completion, then retry operator will resubscribe the source Observable and starts emitting from start again. Suppose we have used retry(3) in our code, it means for any error in source Observable, it will be resubscribed up to 3 times. If in first attempt of resubscribe by retry(3), it completes normally then no other attempt to resubscribe will be made. RxJS retry operator is imported as following. 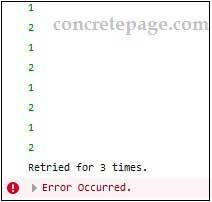 Here on this page we will discuss retry operator with examples step by step. The RxJS retry operator subscribes the source Observable if it does not complete due to error. Now find the examples for the given scenarios. Ex.1: Total max 3 retry, but no success and throw error. For the demo suppose we have of(1,2,3,4) that will return Observable instance and on subscribe it will emit 1,2,3,4. For the retry demo we will throw error so that this Observable instance does not complete successfully. Look into the above code. When the data is 3, an error is thrown. But before throwing error on subscribe, retry will try for 3 times maximum to get subscribe it successfully. If no success then finally error will be thrown. The Observable instance will be subscribed 1+ 3 times totally. If in first retry only, source Observable is subscribed with no error, then there will be no more retry. In the above code for the first subscribe and retry 1 subscribe and retry 2 subscribe, there are errors. But in third retry, error is not thrown and Observable successfully subscribed and completed. Here we will create an example of retry with catchError operator. catchError handles the errors thrown by source Observable. Using catchError we can throw a default value or user defined error. In the above code we are throwing error when Observable emits "B". We have passed retry count 2. After all retry, we are still throwing error in our code. Once all the retry is complete then error is caught by catchError operator. From catchError we are throwing source Observable with default element as "X". When we access data over HTTP, some errors can be handled by just retrying request such as if errors are transient and unlikely to repeat. For example if we have slow network error and our request could not become successful then there are the chances to make request successful if request is retried. Find the sample example. We can see output in console as following.